The field look like the back of a pickitup truck as the SA5 XI arrived at Lenasia Progress Grounds, eager to continue where they left off after a convincing victory against Old Maristonians 7 days before. After some picking it up, and sweeping excess water off the playing area, the game began with MCC bowling first. It seems Nasier's usage of Sheen for 'curvy' hair from Pops paid off, as he went on bamboozling the Swaraj top order with a 'fifer' 5/25 off his 8 overs. Moosa , Kadwa , Eboo , Archie ,telephone numbers. All in all a lesson learnt. Elementary error not completing the allotted overs costed in the end. 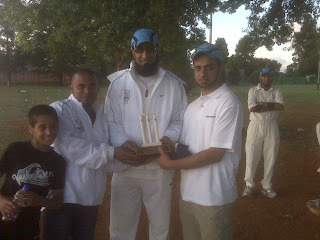 Men of the Match: Farhaad and Nasier.